Have you considered having laser hair removal but lack the motivation to get it done? Stop procrastinating -- throw away the razor and commit to laser! We have been off all summer and are ready to get it going again but we need at least five clients to get it started. Here is incentive to help you say yes! for you to use on any other spa service. Please ensure there is at least a few days of hair growth for your assessment. Dry Skin is skin that is lacking lipids and water. Water constitutes 70% of the dermis and is vital to the skin to preserve its youth. All skin types can be dehydrated even those who have oily or combination skin. Sebum is a key oil in the skin's natural protective coating and is essential to lock in moisture. An equilibrium in water and sebum is fundamental to a healthy skin! There are many ways to tell when your skin is dehydrated: If your skin is dull or without glow, rough to touch, lacks elasticity and suppleness, feels taut or uncomfortable or is irritable and reactive you may be dehydrated. Weather plays a large role in how our skin reacts as do health problems, improper skin care routine and pollution. If your skin is dehydrated try the effective combination of GM Collin's Hydramucine Concentrate and Optimal Gel or Cream. If you are a Yonka fan, try any of the Dermol Serums 1, 2 or 3 (depending on your skins needs) and cream 28. As our 20 year anniversary draws near we are thrilled to reach this milestone. We realize that without our fantastic clients we would not be here, so we have decided to give our loyal visitors the chance to win a fabulous gift package for their referrals! We can't think of a better way to say thank you than to reward you. And who doesn't love spa gifts? Forward this email to all your friends who have never experienced the serenity of Skindulgence or pick up our referral cards at the spa. Have them come in for their first service* so they too can indulge in one of our luxurious treatments! Be sure they mention your name as the referral and their reward will be a set of 4 introductory certificates for their next visit. For every friend you refer, your name will be entered into a draw to win 1 of 3 prizes; one $100 spa service gift certificate and two $50 spa service gift certificates! The more friends you refer the higher your chances are to win. In addition to that, the client who refers the most people during this six week campaign will win a prize package worth over $600! The contest will end the weekend of our anniversary, November 20th 2009. New clients - Don't be shy! You too can refer your friends and be entered to win the gift package just like the friend who referred you! The more friends you refer - the better chance you have at winning so spread the love and get rewarded! It pays to SPA at Skindulgence! Clear or the NEW "Rose"
When you book an Express Facial and Eye Treatment! or other promotions, While quantities last. The 7th annual West Coast Chocolate Festival is almost here! Come celebrate delicious, high caliber chocolate in many unique and inspring forms. Experience innovative chocolate-themed events that occur throughout the Tri-Cities area of Coquitlam, Port Moody and Port Coquitlam. *NEW* - This year the festival will be expanding to the rest of the Lower Mainland! "Just here for the Beer... and Chocolate!" more info on the exciting lineup of events this year! October is traditionally dedicated to breast cancer and awareness of the critical disease that takes our mothers, grandmothers, sisters and friends. Over the years Skindulgence has supported many fundraising iniatives and honour the Breast Cancer Research Foundation in their journey towards curing breast cancer. We are challenged by the reality that only 18% of government grant applications that the National Cancer Institute wants to support get funded. And that 10% fewer patients are in clinical trials because there is not enough money. Show off your pink pride with the many accessories at Skindulgence starting at just $2.25! From pens to playing cards, tissues to tins of mints, and hand soap to handbags - we have everything you need to show the world your support for breast cancer research! As the weather is changing so is your skin, especially your mouth which can get chapped and raw. GM Collins offers an amazing lip plumping complex available in clear or tinted rose. It will plump up the volume and re-densify your lips to a lusher, fuller state. The lip plumper maintains an optimum moisture level while is softens, smooths and improves lip texture with it's micro-collagen technology. And best of all, it helps to reduce the fine lines in the lips! It's the perfect alternative to painful lip injections or lip glosses that sting and irritate the sensitive skin of your mouth! It's also imporant to exfoliate your lips too, as it the most common area we forget to exfoliate. Exfozyme is the perfect exfoliant for your whole face including your lips! Check out October's promotions to find out how you can get GM Collin's Lip Plumping Complex for free! This treatment oil is best used after a shower or after using the Body Exfoliating Gel. This nourishing delicate oil has five essential oils, lupin oil, wheat germ oil, argan oil and is rich in omega 3 and 6 which helps to preserve the skins youthfullness. It will enhance the skins elasticity and firmness with its quick absorbing texture leaving the skin soft and supple.Excellent to mix into your body hydrating cream for a richer texture. GM Collin has captured liqiud gold in a bottle! A long time client favourite, Lipiad can help if your skin lacks oil, suppleness or softness. It is a special blend of active ingredients including borrage, lupin, macadamia, jojoba oil, olive oil, wheat germ, soy bean and vitamins E&A. Lipiad is amazing under any moisturizer for a boost of elasticity, suppleness and hydration. It is perfect for dry-alipidic skin types all year round but can also be used on other skin types throughout the winter. Have you experienced the GM Collin golden pearl? Ceramides are an excellent environmental protection especially for the winter season as it acts as an anti-dehydrant. 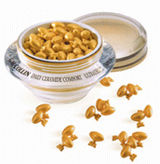 This dry-oil complex can be used on all skin types. It will nourish and protect against all elements. Apply a golden pearl as the last product over your moisturizer and it will reduce the taughtness & dryness in your skin, a winter necessity for your skin. Available in containers of 75, 50 or 20 individual Pearls for daily use ~ keep a few in your travel bag for that last minute trip. © 2008 Skindulgence The Urban Retreat Ltd. All Rights Reserved.